Last up-dated 2018. This model line graph for IELTS is estimated at band score 9. The model answer below is for IELTS writing task 1 academic paper. Use this sample writing as a template for structure, key features and language for any IELTS line graph. There are also some tips given below to guide you and help you understand how to describe this type of graph. The graph below shows the consumption of 3 spreads from 1981 to 2007. Source: Graph above not created by IELTS Liz. Source unknown. The line graph illustrates the amount of three kinds of spreads (margarine, low fat and reduced spreads and butter) which were consumed over 26 years from 1981 to 2007. Units are measured in grams. Overall, the consumption of margarine and butter decreased over the period given, while for low fat and reduced spreads, it rose. At the start of the period, butter was the most popular spread, which was replaced by margarine from 1991 to 2001, and following that low fat and reduced spreads became the most widely used spread in the final years. With regards to the amount of butter used, it began at around 140 grams and then peaked at 160 grams in 1986 before falling dramatically to about 50 grams in the last year. Likewise, approximately 90 grams of margarine was eaten in the first year after which the figure fluctuated slightly and dropped to a low of 40 grams in 2007. On the other hand, the consumption of low fats and reduced spreads only started in 1996 at about 10 grams. This figure, which reached a high of just over 80 grams 5 years later, fell slightly in the final years to approximately 70 grams in 2007. Paraphrase the line graph information for your introduction. Put main trends and any other key features in an overall statement. Make sure each body paragraph sentence has numbers and dates to support it. Check the video lesson below to learn how to write a complex sentence for an IELTS line graph report. Practice!! Click here to get a selection of sample line graphs to practice writing for your writing task 1 preparation. Hi Liz, thanks so much for your tips. Your website is the most useful IELTS prep tool I’ve seen online. I just finished my test. Not sure how I performed but reading your posts and practicing based on your charts definitely helped. Both are fine. However, make sure you don’t miss it. It is the most important part of your task 1. Unlike your model answer, Some people say that we cannot write data in bracket in writing task 1. Can you please clear the confusion that what should I do? If it wasn’t not acceptable, I wouldn’t write it. i’ve a query to ask. Is “Delineates” a good replacement of “illustrates”.? If they can be replaced which one will put a good impact on examiner.I’m saying this question because i think everyone who is preparing for IELTS uses same sites,due to which they may use the same vocabulary.Is it good idea to change the vocabulary to be prominent and different.? Writing task 1 is a report, not a creative essay. The linking word “overall” is the best linking word for an overview – there is nothing to change. You are not marked on your ability to be creative. There are plenty of words to paraphrase in your report, but not those. Can you please upload an image of solved and well structured Writing Task One.The issue i’m facing is at some point my paragraph end up in the end of line,If i start the new paragraph from the next line,it will not give the look and feel of new paragraph but seem to be the part of same paragraph.It make me confused that from where should i start new Para. Leave one empty line between paragraphs. I tried ti write this graph by myself. Could you please check it amd give your opinions. I would really appreciate your considerations because it would help me lot in exam preparation. The line graph delineates in terms of the number of grams of three distinct kind of spreads (butter,margarine, low fat and reduced spreads) consumed by people over the periof of 26 years between 1981 and 2009. On analyzing the graph, it becomes lucid that in 1986,the maximum demand was of butter with about 140 s, followed by margarine with nearly 90 gms. After 5 years, the former reached the peak value at 160 gms while the later declined to 80 gms. However, after the mid of 1986, the usage of butter fell drastically and became almost half of the initial value at almost 70 gms in the year 1996. Moving further, after 1986, the demand of margarine increased steadily and became constant after reaching at 100 gms upto the year 1996. In the mid of the year 1996, the consumption of both butter and margarine fell down and reached nearly at 50 and 40 gms respectively in the last year. On the other hand , the reduced fat and spreads appeared in the market while its usage was low at 10 gms intially and them inclined drastically in the next 5 year with 80 gms in 2001. Thus figure fell slightly by 10 in the final year. Hence, it is apparent that during the given time period, the utilization of butter fell down drastically while that of margarine moderately as this demand was replaced by low fat amd spreads in thd last years. I would like to know when should I use ‘”illustrate” or “illustrates”? For example, here you used the plural but in the pie chart example the singular. OMG, the model answer is much better than those provided in general IELTS practice book I brought. Thanks, I learnt heaps from good model answer! Your doing a fabulous job . I have IELTS exam on next month 13. I hope all these tips give me a way to crack IELTS exam. 13th of october right? I am Also having on the same date. Wish you best of luck. Hi Liz, l have been practicing for IELTS academic on this website called ‘CAMBRIDGE WRITE AND IMPROVE’ no matter how well you write it won’t mark you over a 6.5 band, I tried copying the above written into it and the website marked this a 6 band. Where is the mistake ??? AS you know, IELTS use people (human beings) to mark IELTS writing tasks – not computers!! Is it necessary to write an overview in writing task 1 ?? thanks for all of yours advises and videos. please where we can find the answers of samples for line graph which you put the link to practice on? Go to the RED BAR at the top of the website and click: writing task 1″. All my tips and answers on are that main page. the line graphs depict the proportion of smokers and the consumption of alcohol in liters on various chosen countries in the period of four decades.In general, there is a downward trend followed by all these countries. Do you think your overall statement, which is your last statement, is fully described or limited? You have highlighted only one key feature – this is a limited overview and scores lower than a full overview. Most graphs or charts have two or three key features. can I write overall with introduction without leaving a line? Look at ALL the model writing task 1 on this page to find your answer: http://ieltsliz.com/ielts-writing-task-1-lessons-and-tips/. Do the work first and ask questions later. Greetings! Thank you for the wonderful work you’re doing, Liz. I’ve one quick question. Is it okay to begin my writing task 1 with “The given line graph illustrates to compare the difference in consumption of three spreads (margarine, low fat and reduced spreads and butter) between 1981 and 2007.” or does it sound a bit too much? Much thanks! It is fine, but you must take out “to compare” – it is incorrect to use those words in this sentence. Hi Liz, I am facing issue of time management in task 1. My easy reaches 200+ words in 25 mins almost,as I am feeling it difficult to concise the info. How can I overcome this? How long do you spend planning? Do you plan what information will be grouped together, what information will be highlighted separately? Do you spend time deciding which are the key features and which features are less relevant? Planning is equally as important as writing. Can you please tell me, is it okay if my words exceed the number 150 for task 1? if yes then what could be still acceptable? will they count penalty for exceeding s well? I am confused by your question. The instructions tell you to write OVER 150 words for task 1. I believe this is a IDP format. Is it okay to use this format for British Council? There is no such things as an IDP or BC format. IELTS is one company with one scoring system. All examiners are trained in only one way. My lessons follow the IELTS accepted format for scoring. I am writing my academic test soon and I am very confused of the writing task 1 structure due to the official IELTS British council revision programm and sample answers. They do not always have an overview but only have 1-2 sentences at the end, that are not exactly like an overview but only state the Overall Trend. Where do you think should I put my overview? And how detailed must it be? Are your model answers approved band score 9 model answers? I would be very grateful if you could reply soon! Hi Liz, Thank you for the dedication you put on your own site. Can I ask you about Writing Task 1? When I look at some sample essay, why do they put in some Past Perfect Tense of the Verbs sometimes when using Past Tense Verbs for that essay? Writing task 1 is not an essay, it is a report – make sure you understand the difference. Overall, margarine and butter date back to the 1980’s while lowfat and reduced spreads appear around 1996. Lowfat and reduced spreads had the greatest increase which is between 1996 and 2001. Quite the contrary occurred between 1986 and 1991 where there was a significant decrease in the consumption of butter. There was a plateau between 1991 and 1996 in margarine consumption. And instead of repeating consumption on and on. What other words do you suggest I should use? You can use words such as expenditure or use; or, you can paraphrase the idea into an action. E.g. “Quite the contrary occurred between 1986 and 1991 where butter was significantly less consumed. Also, the consumers’ use of margarine between 1991 and 1996 was the same. It is best to use the symbols. Is it okay to write short forms like i.e. ( that is), etc. No. This is a formal written language test – no short forms. It’s fine to use informal language in speaking because the speaking test is informal. You used “ after” but I think it would be before because 90 grams is the former and 40 grams is the latter. Am I wrong? “after which” means next . Don’t get your vocab or grammar confused. The meaning is 90grams and then 40 grams in that order. Is 186 word TASK-1 and 290 word TASK-2 is perfect? Especially when trying for 8+? There is NO perfect number of words. The aim is a focused piece of writing between about 260 -290 and 160 – 190.
ma’am can we write overall before body paragraphs or after introduction ? Can I use the verb form SKYROCKET in Task 1 line graph? I am sceptical about this since it sounds more colloquial. Thank you. The verb “rocket” can be used but only when there is a very dramatic increase. It is not common to use. There are no rules in IELTS about using numbers in the overview. On the whole, most overviews will not contain numbers – just a general descriptions of the main trends. But not in all cases. For example, with tables, your overview might contain totals. In this case, it contained two significant dates. Teachers give black and white rules because it’s easy to teach that way – but these rules do not exist in IELTS. Teachers really need to explain to students that some advice is just recommendation and other information is a hard rule. IELTS writing task 1 can I use conclusion is possible to good score or don’t use conclusion? Hello Liz, thank you for your great help. I can see that in this task, you have organised the paragraphs based on the fact that the consumption of margarine and butter has fallen during the period, while the consumption of low fat has increased. I wanted to do a writing by myself and a similar graph consisted in four lines that fell down during the period. How can I organize the paragraphs in this kind of graph? You need to look for similar patterns. Some decrease quickly and others slowly. Some are higher and some are lower. Organise details logically. Also remember that numbers do NOT fall down, they fall. reading your model I notice that you wrote a comparison only in the overview, while in the body paragraphs are reported only the main features of each spread. I want to ask you if writing comparison in the paragraphs can improve our score (because they ask us to make comparison where relevant). For example: The butter was the most consumed fat in 1981 with a value of about 140 grams, much higher that of margarine in the same year that was approximately 90 grams,.. and then continue with the description of the trend of butter. Bar charts usually require comparisons in all paragraphs, line graphs do not. The trends in each line are different and are reported differently. This isn’t a fixed rule but it works for most line graphs – unless trends are very similar. Should not we write overall at the end, instead of 2nd para? I’m confused, I have cracked general IELTS using your website and now I’m preparing for academic IELTS. Can you please write in brief why it should be 2nd para and not last. Thank you so much, Ankit. Hi liz i have been using you website for quite a time now. Actually i had given my ielts exam and the result was. how many times u did iets exam to get this result pleas ? I mean to say in all kind of writing tasks such as line,pie,bar,map and other ?? I’m in a doubt. Why I’m thinking that you didn’t write article (the) in overall statement ? I mean to say, there will be article “THE” between “OVER” and “PERIOD GIVEN” such as “over the period given” rather than “over period given”. Is it necessary to conclude at the end ?? Other websites and books mention u have to conclude !! A bit confused ! Can u please help ? If you have an overview, you don’t need a conclusion. Writing task 1 is not an essay, it is a report. The examiner is looking for an overview in task 1.
hi liz , help wanted , i have a test on 28th of this month . I read your sample answers for all kinds of writing questions and I saw that we can write three body paragraphs (for example in 1962,1985 and now map model and food/drinks/tobacco etc. table model) but I am still not sure whether to use this kind of organization or not for this question. Thanks for all your helps! The aim is to show the examiner you can identify similarities and differences. It’s not wrong to have three body paragraphs but it won’t help your score. Is it okay to just write ‘Margarine decreased slightly…’ instead of ‘Consumption of margarine decreased slightly…’? I’ve seen some other examiner’s model answer writing just like that in the first one like ‘Beef and lamb show a similar downward trend..’. This really confuses and concerns me as it may increase my word count unnecessarily. The actual margarine doesn’t decrease. You can’t say “the cars decreased” but you can say “the number of cars decreased”. It is essential that you use the right noun phrase. Thank you for the reply. Really appreciate it. How to make interesting and original writing ?? Your writing does not need to be interesting or original. I suggest you learn more about how IELTS writing is marked. Hello Liz, we should use simple tenses in writing task 1? If it is in the past, use simple past tense? Thank you. Hi Liz, can you help me with my writing? 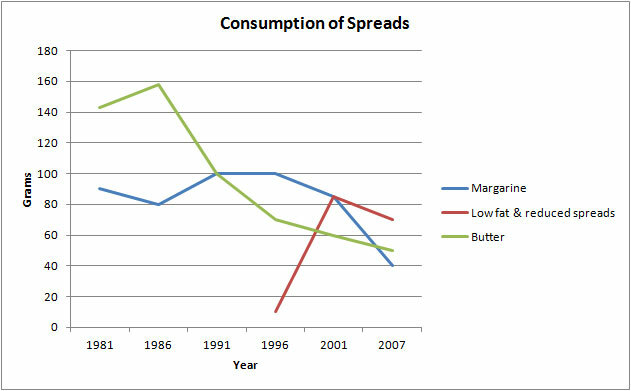 The line graph gives information about the three types of spreads ( margarine, butter, low fat and reduced spreads) popularly consumed from 1981 to 2007. Units are measured in grams. Overall, the consumption of margarine and butter gradually decreased over the period of time., while the used of low fat and reduced spreads started to rose from 1996 until the final years. At the beginning of the study, margarine was widely consumed spread until 1991 and it was replaced by the butter on succeeding years. In terms of butter of butter consumption, at the beginning about 140 grams was eaten and it peaked in 1986, just under 160 grams used. Its popularity fell dramatically until 2007 (about 50 grams). In contrast with margarine used, it started at almost 90 grams of consumption and experienced stability in the years 1991 and 1996 (100 grams), but it gradually went down in 2001 and 2007 ( about 82 grams and 40 grams respectively) In 1991, butter spreads used increased by 10grams as the same with margarine. Meanwhile, in 1996 consumers began to take low fat and reduced fat spreads about 10 grams. It climbed up to over 80 grams in 2001 but it reduced slightly to 70 grams in 2007. I would like to suggest some changes in your report. You have a lot of writing errors that can be avoided if you revise after writing.I have done that and it helps a lot. I really like your website and appreciate all the great work you’ve been doing. I often recommend your resources to my students and they think that everything on this page is perfect English worth copying in their writing. For this reason I would ask you to review point 4 in your tips. I believe it should be “Each sentence HAS”. Thanks a lot for your great help. I was looking for some sites like this and my friend suggested this. It’s really helpful. I’d like to know how the words are counted in writing (academic). Is there any difference in AT and GT word counting criteria? Hi Liz , my name is Abdi, First of all i want to thank you for your generosity in giving those enlightening lectures. I wanted to ask about the overall, i have listened to many IELTS lectures by different teachers and they all agree that there shoudn’t be included any data in the overview and secondly some of them say it should only be one sentence either complex or simple with only the key features mentioned. what is your take on this? There are no rules for the length of the overview. IELTS have not set this rule. The only rule for examiners who mark your writing is that your overview must contain all the key features. Usually there is no data in an overview but if you have a table with totals when you can include the totals in your overview. Teachers will give rules to help students learn. But do not confuse these rules with IELTS rules. Avoid using “we” in IELTS writing. I’ve noticed in your writing task 1 model answers that you are not quite fond of mentioning comparisions like one-third, one tenth and doubled etc whereas, all other ielts teachers highly recommend using these, and refrain from giving exact percentages and figures . I personally find it complicated while practicing ,can you please highlight how does it effect our band score ? If the graph gives exact data, you must present exact data. Descriptions are fine to some extent but all descriptions must be supported by precise data – this is a requirement of IELTS. i want to know in writing task 1 if we start our introduction with following line it’s good or not? “Prima facia it is conspicuous that the given chart illustrates”. Task 1 isn’t an essay. It is a report and it’s better to use brackets – they are not examples, they are the actual list. but we can use brackets in report? Of course. Writing task 1 is a report and in report writing, it is usual to present some data in brackets. I could not find answers for all writing task 1 questions rather those in the home page.I had found it once but I couldn’t find it again.please help me liz. In terms of making a plan for the writing part (both task 1 and 2). Is there a separate page of paper where we can write all of these plans or are we suppose to write them on the questionnaire of elsewhere? I just though that making plans is really important and visually seeing them is equally needed. Hope you can make a reply on this. Thanks. All notes and plans should be written on the question paper. There is no extra paper for planning. If you run out of paper on your answer sheet, you can ask for another sheet (but only when your answer sheet is full). What should be the “tense” of writing when line graph is given from 2001 to 2050?? Will it be in past tense or present tense?? It will be past and future. “The number of sales stood at (past tense) 1 million in 2001 and is expected to rise to (future form) 10 million by 2050.
the sample of writing task 1 you posted here is very older dated nov,2014. has some rule changed over the years? The way the test is marked and the requirement for the band scores have not changed at all. Is it okay if I cross the word limit? While attempting one of the samples from task 1 I realized that I wrote 168 words instead of 150. The instructions are to write MORE THAN 150 words. You will be penalised if you write less. You should aim for between 160 and 180 in task 1.
can you plz give a comparision charts,i am facing trouble in that. can we use brackets() in writing task 1,because my tutor told me it is not the right way.Also is it okay to write in number below 10.kindly advise me.Thanks in advance. Yes, it is usual to use brackets in task 1 to include data. If the number is descriptive, then write it in words under the number 10. If it is a statistic given in the chart, it is in digit form. Is it always “overall”? Can I use “As can be seen in the graph” or “generally speaking” to denote that this is the overview? The most important thing is that the examiner can locate your overview quickly and easily. The linking words “overall” signifies an overview – it is the best word to use. Hi Liz, first thanks for your lessons! It’s really helping a lot. Just have a question cause i’ve been seeing sentences that says “the number of people has increased”. I don’t know if i’m wrong but since it’s a past tense i am used to writing had increased instead of has. Is that wrong grammar construction? On the whole, you don’t need to use perfect tenses in task 1 but it does depend on the chart in question. Hi liz, here is my introduction of a report from cambridge 11, test-3. may you give me check please.. The line graph illustrates the amount of carbon dioxide (CO2) which was emitted by per person over 40 years from 1967 to 2007 in four different countries United Kingdom, Sweden, Italy, and Portugal. Units are measured in metric tonnes. You can’t write “by per person “. You either write “emitted per person” or “emitted by people”. Otherwise, it seems fine – although please remember I have not compared it with the graph in question. It’s certainly one way to tackle a line graph. But it does depend on the trends in the graph given. Some graphs have obvious time periods which apply to all lines. Other line graphs show that each line has different key features that occur in different time periods so using time periods to organise the report isn’t logical in that case. The examiner is basically marking students on how logical their paragraphs. So, yes it’s possible to divide by time periods but it depends on the graph. Describing each line separately in the body is often safer. Also the reason why students want to divide it by time period is because it allows them to compare and contrast the lines. Doing this isn’t always necessary. Comparisons are always given in the overview and the body paragraphs don’t necessarily need to compare. hello, Liz, I saw the model answer and counted it. but there more than 200 words, is it ok for task 1? but it had written so understandably. Most writing task 1 will be between 160 and 180 words. Unless your language skills are excellent, you should never go over 200 words. Mam is it correct to write , The graph elucidates on the amount of intake of three kinds of spread . what if the vocabulary in or writing part is wrong? and in which terms will they evaluate the writing part? because i have only written 27 lines. Hi liz,,,is it not important to give conclusion for writing task 1??? There is no conclusion for task 1. The examiner is looking for an overview which is a statement containing the key features. thank you for clearing my doubts and also thank you for guiding us how to write. The examiner is looking for an overview in task 1 and a conclusion in task 2. Some people call the “overview” a “conclusion” – it is just a way to phrasing it. The information provided in the line graph demonstrates the community of various kinds of turtles( leatherback turtles(19), green turtles(38),all species(111) and olive ridley turtles(20)) in India over the period of 32 years between 1980 and 2012.Units are measured in Index which was equal to 100 in the year 1980. Don’t put brackets within brackets – it’s confusing. Looks good but avoid brackets within brackets.I’m now getting courage to go for it. mam can the overview be given in the end of writing task 1? or is it mandatory to give it in the 2nd paragraph? Sure it can be put at the end of the report. You have never given us a sample of Diagram type of question for Task 1 – Academic IELTS ? Kindly provide a sample of how to approach a question with a diagram / map or something on those lines ? here you write main body paragraph which not included any full stop and continued the sentence. would you tell me how can you appply this approach in a sentence and what is that strategy? You will find that each of the paragraphs above contain a full stop. Even so, these are reports, not essays. The paragraph length is not balanced and could even consist of one sentence. But not in the model above. Thanks so much for your valuable help and really i fell god on following your lessons. Hi, Liz! I’ve been practicing on charts you gave as examples for training and I found the line graph about turtles quite challenging. I didn’t get what this index number means and also the number in brackets after the names of turtles. Can you comment it please? Thank you! You will find that IELTS sometimes gives charts with data which can’t be explained. In these cases, put the data in the introduction. For example, put the number next to the names in the introduction and don’t repeat them again. It’s very useful to do that as you don’t need to explain in the introduction and, once stated, you don’t need to repeat it. I just want to say THANK YOU for this free tutorial. I only have 30 days left for my exam waah! I’m nervous. You’re welcome. Go through all the main IELTS pages to find over 300 pages of tips etc. You can access them through the red bar at the top of the website. You can learn a lot in 30 days. Good luck! The bar chart illustrates the amount of money spent on five consumer goods (cars,computers,books,perfume, and cameras) in 2 countries,namely,France and the UK,in 2010.
is a comma required after perfume ! are commas required before & after namely? You don’t need the comma after the word perfume. The line graph illustrates the number of turtles (Leatherback turtles, Green Turtles, Olive Ridley Turtles and All Species) over 32 years from 1980 to 2012. The index was estimated in 1980 with an equal amount of 100 for every type of a turtle. is it necessary to write a over view for mapping and diagrams. All writing task 1 for the academic test MUST have an overview. hey! liz why you wrote more than 150 words? why im asking is, because we have word limit naaah! thats why im asking can you please clarify me? You MUST write over 150 words. If you write under 150 words, you will be penalised. Hello, Liz. I’m very grateful to you. Thanks a lot. I hope that all of you, are doing well. I am taking IELTS in the coming month. I need some practise and preparation partners. My contacts are linked below. I have a question. What Grammar point do we usually use for describing graph or bar chart ? Do you mean grammar tense? You use the tense that relates to the dates given. If no dates are given, use present tense. Hi, Liz. I wonder whether i have to conclude what have been reported or not. It’s not always easy to find ways to use the passive voice in report writing. The main type of task 1 that uses passive voice is the diagram or process – it’s not common for line graphs. What if I use this line during summing up overall that is” entirely, scrutinising the line graph reveals that percentage of…… “. Will using this line on the place of overall …right or wrong? I just try to make a new line…. help me with this. Just use “overall” – don’t learn phrases to get a higher score. The examiner is trained to assess your level of English, not your ability to remember sentences packed with unnatural vocabulary. Thanks for your website.This is very good for me.I am now preparing to take the IELTS exam. Is the overview can be given in last paragraph as conclusion or it should be after introduction. In other words is this format right? Hope you’re doing well. I’ve Just one question in the mind. ‘fell’ is correct. fell is the past tense for fall. it meant from 80 grams, consumption went down (fell) to 70 grams. felt is unrelated because that is the past tense for ‘feel’. Good evening !i am from Kazakhstan and I wanna get some useful advises in writing ))can we keep in touch by What’s app? Thanks for the useful writing. In the exam they are 2 line graph in this case, what I can do ? Write each line graph in different paragraph or what I do ! Yes, that’s right. Put a comparison of the lines in the overview. The examiner is looking for an overview in task 1 and a conclusion in task 2. The given line graph demonstrates the consumption pattern of 3 spreads over the period of 27 years commencing from 1981 – 2007. When the overall graph is concerned, it is clear that the consumption of Margarine and Butter has declined over the years whereas the demand for low fat & reduced spread started to dramatically increase. In 1981, there was a huge demand for Butter among people. The consumption at the initial stage itself was around 140 grams, whereas the demand for Margarine was just half of the Butter consumed. The Butter consumption was continuously expanding and was at peak during 1986. In the meantime, the demand for Margarine rapidly decreased and came down to about 80 grams. Thereafter, in 1991, the consumption pattern entirely changed. People started to prefer Margarine more than the Nutter. This pattern existed until 1996, when the low fat & reduced spreads entered the market. Since the introduction stage itself there was a dramatic raise in the consumption of Low fat & reduced spreads, while the demand for Butter and Margarine fell down simultaneously. Notwithstanding, from the year 2001 onwards the consumption of all three spreads declined, being the the Low fat & reduced spread the highest and the Butter the lowest. The line graph illustrates the 3 eaten ingredients over the period of 1981 and 2007.Overall it can be seen that butter was the most popular one while margarine and low fat and reduced spread was least popular at the beginning of 1981 and regardless of the alterartions, during the period,they all went down at the end of 2007. In addition,in 1981,margarine was used about 90 grams,however,a flucuotion seemed until the end of 2001 and it decreased until 2007. However,while margarine has always been consumed low fat and reduced spreads never being useduntil 1996,yet the ampunt of consumption,was very small,it was about 10 grams .Nevertheless in 5 years the amount of grams has increased amd later on climbed slightly. I am so happy by visiting your site..
thnks for all the help! just wanted to ask if ” over the time period is correct or over time period ” in the above case senerio . The line graph illustrates the amount of three classifications of spreads which were consumed from the year 1981 to 2007. The units are measured in grams. Overall, majority of the people used up greater amounts of butter in contrast to margarine in 1981, before the decline of both condiments in 2007. Moreover, low fat and and reduced spreads had a meger acceptance in 1996 before gaining the largest share in 2007 as opposed to margarine. In 1981, butter was the widely used spread which stood at 140 grams and peak at 160 by 1986. The trend however was not sustained as it declined in a span of more than two decades owning up to 50 grams. The consumption of margarine in 1981 was at about 90 grams but dwindle down to 80 grams in 1986. By 1991 it shot up to 100 grams and stood at a plateau for 5 years with a gradual decrease plumething to 40 grams in 2007. On the other hand, low fat and reduce spread was introduced to the public in 1996, which started at less than 20 grams in total. The usage of such spread quickly gained favor which increased by more than 80 grams in 2001 and a difference of 10 grams in 2007.
hi Liz ! can i ask an example of a graph with projections! thanks a lot!More power! i am looking for good starting phrases from every para starts. Please help me if possible. I appreciate your practical advice for IELTS. I would like to ask one question about the line graph. Are there any correct answers about the graph? For example, when I look at the graph above, I thought the amount of low fat and reduced spreads finally went down same as the other two lines, but the model sample said the line went up. If I have a different opinions, I cannot get higher score? The line graph illustrates the percentage of vegetarian diet among young people in UK between 1960 and 2020. Overall, there was an increase in the percentage of vegetarian at start of period given. The rates of young vegetarian were remained fairly in the final years. In 1960, only small percentages of adolescents were vegetarian. There was a significantly increase until 1980, when over 15 percent following a vegetarian diet. Between 1980 and 1990, usage of vegetarian diet dramatically decreases to approximately 7% and then it fluctuated over the next decade after 1990. The period between 2000 and around 2012, percentage of adolescents following a vegetarian diet rose gradually than compared with previous few years. After it rising steeply until around 2012 and it leveled off. It is expected to continue over the next few years. ‘with regards to’ or ‘with regard to’ ?? Hello, Liz. Yo are doing the great job! Thank you so much! Could you check, please my analise of graph line. Just cant bring up my thoughts togeather. I know, we must use different expressions, but it seems to me i make many mistakes. The diagram illustrates the amount of readers by gender at Burnaby Public library from 2011 till 2014. It is witnessed a steady increase between numbers of readers both genders over the four- year period of time. In 2011 women read about 5000 books at Burnaby Public library, when men read no more than 3000 books at the same library. The amount of books read by woman gradually rose during the next two years and reached its peak in 2013. However, the diagram demonstrates a dramatical decrease in numbers of books that woman read at Burnaby Public library in 2014. Meanwhile, the quantity of books read by men at Burnaby Public library rapidly increased from 2012 till 2013. And in 2013 men read the equal amount of books with the numbers of books which were read by woman at Burnaby Public library in the same year. In the contrary to the woman line, the men line graph shows the considerable growth in numbers of books read in this library during 2014. Hello, Can you please check my writing if i send it to you? I need to improve my speaking as well. hi Liz just want to ask if u have any example for a projected line graph because in oct 2015 exam it is asked in task one 1, im still confuse pls help ,, I browsed you post but I did not find anything about it. hi liz..again I want to consult my task 1….I also want to ask what do you mean to ” year ended December”.. does it mean from jan-dec.. so maybe I could say The study was conducted over a decade from 1990 to 1999. The line graph illustrates the number of recorded theft case of vehicle in four different country, namely Great Britain, Sweden, France and Canada. The study was conducted between 1990 and 1999. Overall, Great Britain remained to have the highest rate of theft case among the four, while France remained to be the second most high rate of theft case at the end of the period. To begin, Great Britain having the most most count of vehicular thefts started with around 17000 that fluctuatingly decreased to around 16000 at the end of the period. In contrast to France that initially came with around 9000 cases, gradually increased up to 13000 in 1999. With regards to France and Canada that begin from around 6000 and 7000 cases , the earlier intercede with Sweden by the next year at around 7000 cases then proceeded to reduced erratically until it met up with Canada at less than 6000 cases at the end of the period. Can we also write what both axes represent ( for example, y axis represents grams consumed and x axis represents dates) in the introduction? This link will take you to all my line graph lessons: http://ieltsliz.com/tag/line-graph/. Unfortunately, I don’t have more at present. In writing task 1, is it important to avoid shortcuts for example if i write united kingdom instead of uk ? That is not a short cut. It is an official way of writing the country name. It is used by IELTS so it can be used by you. so is it fine to write it as united kingdom or just leave it as uk? Just leave it as the UK, if IELTS have presented it that way. Is it okay to divide 3 kinds of something in one group and the 4th one in the second if there are 3 figures which increase over period given and only 1 which decreases or remains stable? Although it’s logical, I’m confused that the 1st paragraph is large while the 2nd is very short. The paragraphs do not need to be balanced in a report. This is a report, not an essay. Yes, it is logical to organise body paragraphs according to similar trends. I have some questions for you related to this line graph. Firstly, can i use “which” twice in one sentence. For instance can i start like this : The line graph which is given below illustrates the quantity of three spreads (margarine etc.) which were consumed over 26 years between 1981 and 2007. Secondly, the consumption of low fat and reduced spreads passed to the others after 2002. In this case can i use the word called “overtook” or this word’s meaning is just abour racing things? I i cannot use this word, can you give me the best word for this point? Sorry I can’t comment on writing. Hi Liz ! Here is my report of the graph, please check it and fix it if there are some mistakes and which score i can get with this one. Thank you ! The line graph given reveals a comparison between the consumption of 3 chosen spreads, which was recorded every 5 years from 1981 to 2007. Figures are represented in grams. Overall, it is noticeable that despite the fact almost all spreads were very popular at the beginning of its period, the consumption of each pread reduced significantly in the final years. starting at a considerable point in 1981, over 140 grams, the amount of butter used jumped to the peak at nearly 160grams after 5 years. Made Butter had the highest consumption ever in total over 2 decades. Hover, this figure, dropped down in the next following years, which only around 50grams was recorded in 2007. The second most popular spread was Margrine. after fluctuated around 90 grams and 80 grams, Margrine kept stable its consumption during the years from 1991 to 1996, at 100 grams. this was followed by a dramatic decrease to the bottom at 40 grams at the end of period. Meanwhile, Low fat & reduced spreads only started consuming in 1996 but soon gained high attention, with the amount used accounted for over 80 grams. Although there was a slight decrease latter, the consumption of this spread was still higher then the others in the last 5 years. Sorry I don’t offer marking services. There is no conclusion for task 1. The examiner is looking for an overview in task 1 and a conclusion in task 2 – this is not an opinion, it is a fact. A conclusion restates main points, at no time should you repeat information in task 1. See my models and all lessons about this on the main page of writing task 1. There is no conclusion for writing task 1. Please see the lessons about the overview on the main writing task 1 page. I have a doubt about writing task 1 and which is very confusing. My instructor told me that in the overview , i should only mention if there is a variation or a difference or even an increase and a decrease in the trends.However, the point is i should not include the largest trend or the lowest trend because that would be considered a description. I don’t know which one is accurate for writing task 1. All key features go in the overview. You can use comparatives or superlatives to give key features. So is it fine to just mention if there’s a variation in the trends without stating any comparatives or superlatives? All line graphs show variations so that isn’t a relevant statement to make. You need to outline the specific key features of the chart you have. I find your website very helpful to prepare for IELTS.I took my IELTS date 3rd Dec and now I have around 70 day to prepare. I daily use this site to take usefull tips and practice.But I am littel worried about writing and speaking modules. Is it possible to do the whole preparation by my self without joining any coaching for band 8 ? How can I evalute my speaking and writing test? please give best plan to prepare. The best way is to book a practice test at a local IELTS school. Otherwise, you could pay for marking or assessment online. Unfortunately, I don’t have a list of sites available. It is certainly possible to get band score 8 on your own. It depends if your level of English is sufficient. It also depends on your ability to understand the scoring of IELTS writing and speaking. If you can understand how it is scored, you will be able to deliver the required language and ideas for the score you want. Let me say my teacher, I don’t know how to thanks from all your efforts fro providing a complete information about ielts test for people who need it in their academic career. I learned a lot from you and will be continueing in the future to make my English better and better. I would like to ask you two questions. The first,is is necessary to write a conclusion in task 1 ? the second, have I to mention every single detail in the graph in order to score highly ? Thanks so much for your efforts I really appreciate that. Question 1: please see this lesson: http://ieltsliz.com/ielts-tips-conclusion-or-overview-for-writing-task-1/. Question 2: you must select the detail you want to put in your report. If there is a lot of detail you must be very selective. Hi Liz, l’m undergoing training and intend to write ielts very soon.When it comes to the listening section, I find it difficult to here every word that is pronounced.Please how can I overcome this challenge? Don’t try to hear every word, just listen for the answers and key words. I have appeared for Ielts exam 6 times….. Each time have scored 6.5 in writing…. M in need of 7 in each Module … My last Ielts score was R8.5 L8.5 W6.5 S7…coincidentally came across your tutorials on you tube…..you are really best teacher I have came across for Ielts … Heartily appreciate your work….hopefully will score 7this time by reviewing your videos and blogs. Your website is very useful and helpful. I have watched your video about using 4 complex sentences and I’ve been using it in writing task 1. Would you mind reading it? and if you could give me some feedback, I would be more than grateful. Thank you so much for sharing lots of your tips and ideas. This is one of my WT1 reports. The line graph gives the information about the population of turtles in India categorized in 4 groups namely Olive Ridley turtles, Leatherback turtles, Green turtles and all species between 1980 and 2012. Overall, the population of all groups of turtles were stable at the start of the period. It is also noticeable that Olive Ridley turtles became the most populated group of turtles while the Leatherback turtles’ population dropped sharply throughout the period given. There was a minimal change in the population of the two remaining groups. By 1980, the figure of population of the four groups of turtles began at 100. Following that, there was a sharp growth in the population of Olive Ridley Turtles from 100 to approximately 135 between 1980 and 1997,after which the trend fluctuated slightly in the final years. By contrast, there was a slight fluctuation in the population of Leatherblack turtles in the first couple of years, which then peaked at about 110 in 1987 before falling dramatically to about 60 in the final years. With regards to the remaining species, there was a slight change in the population of Green turtles and all species from about 90 to appoximately 110 over a 22-year period. Hi mam, if the units are measured in percentages, can i write “%” instead of “percent” in my report ??? Yes, you can use symbols for percent and currencies. “3 spreads or three spreads just the same as 5 years or five years” for task 1. Is it also correct to say 10 items or should it be ten items? Would it also be accepablet to use word and symbols interchangeably (30 percent vs 30%) in task 1? Any number that is descriptive and under 10 should be written as a word. Any number under 10 which is stated in the graph, can be written as a digit. Thank you so much for the clarification. I really appreciate it. God bless! The significant features of your teaching demonstrate TO GET BAND 9 in the writing part of the IELTS …! thnx very much fo ua videos n posts these much helped me and made writing so easier…. Smoking is a bad habit that results in serious diseases for example lung cancer and some other diseases especially those are addicted to smoking. However, this is a controversial issue because it has its own merits and demerits that will be discussed in this essay. Firstly, the main pros of making it illegal in public places that others will not be effected by the smoke. Apart from this, making it illegal in schools, colleges and universities can eradicate this habit completely. In addition to this, students’ parents will try to stop them from smoking. Otherwise, police will take an action against them for abusing the law. Apart from this, putting labels for awareness can also help them to rid smoking. However, there are disadvantages of banning it in public places. First of all, everyone will not stop smoking in public places because If they smoke somewhere else, government cannot stop everyone. Furthermore, government cannot ban companies because many workers will lose their jobs and they also contribute in GDP. In my opinion, although there are advantages and disadvantages of banning smoking in public places, there are other effective alternative strategies in dealing with combating smoking. One solution is to increase import duties on cigarettes to make it expensive. Due to an increase in import duties many people will stop smoking. Another strategy to overcome this issue is to increase the public awareness of risks of smoking which will lead to prevent them from smoking. A furthermore suggestion is to rehabilitation centre should be built to give them treatment those are addicted to smoking. Please read my notice: http://ieltsliz.com/posting-writing/ Also I suggest you study all lessons and watch all videos relating to essay writing. At no time should a conclusion be longer than the introduction or body paragraph. 1) Yes, you will mention units again in your report. 2) You use past tense if the chart is based on past information and future if the chart is based on future information. You use present tense if there’s no dates given. 3) yes that’s fine. 4) don’t use abbreviations in an English language test. can i use pencil for all modules(writing, listening, speaking tests)? Yes, you can use it for all parts of the test. In speaking, the examiner will give you something to make notes with for part 2. Also, do I need to use present tense while using this phrase? Thank you. As there is no conclusion for writing task 1, you won’t need it. There is an overview, which you can start with “Overall”. Avoid learning phrases to put in your writing – it won’t help your score. So many thanks for your reply to our questions. Many of these questions are common! Hi liz!I would like to ask about the use of “to and by” in writing task 1,especially in increase and decrease.Is it right, increased by 10% and decreased to 5%?Which is which?I have read from your previous answer that it should be by,for example increased by 10%, but how about for the use of to? “by” indicates the difference. For example, an increase from 200 to 300 is 100, so you can write “it increased by 100”. Thanks for your lessons which are really helping me out for my Ielts.I jus hav a doubt, about usage of pen or pencil in the test.I thought it would be better to use pencil, so that I can correct my mistakes in writing module.Will that be a better choice or it may effect my band score. For writing, you can choose either pen or pencil. If you use pencil, make sure you erase any mistakes completely so that your writing is always clear. And choose a darker shade pencil rather than a light one. The choice of pen or pencil will not affect your score as long as the examiner can read all words clearly. I have one question about the word “fluctuate” how can we use it in a sentence to describe for example an item that had been increasing and decreasing continuously ?? is this sentence is correct to use “lamb did a stable fluctuation during the 25 years given” ?!! Yes, the meaning is right. You would write “the amount of lab consumed fluctuated over the 25 year period”. I really need to highlight that I can’t be your private teacher. I answer the occasional question but I can’t teach you. Please respect that this is a free blog and there is a limit to the number of questions I can answer from one student. Thanks very much , and I`m really sorry about that . i did not mean to disturb you or to ask too many question . they are on the blog , you can see them if you like . I’d like to know if you have an example for task 1 when a line graph and a bar graph are given simultaneously? I’ll put one up for you next week. Hopefully Monday. I ‘d also like to ask about whether a conclusion is necessary for task 1? I’ve read some places where it said there should be one but I don’t see one in your model, hence I’m not sure. Mam , I would like to know about words length , this report ends in about 211 words. If we go above 200 does it matter or not? It does not matter going above 200 if you keep your writing focused and relevant. It is something that a band score 9 or 8.5 student can do but students who are band 7.5 and below should aim for 180 words instead. I wanted to know if I have to put a period after name title eg. Is it Mr John Smith or Mr. John Smith ? Also Can I leave a line space between paragraphs in writing task ?. You don’t need to put a full stop after the word Mr. For paragraphs it is recommended to leave one line empty between paragraphs to make them clearer. Is ‘with regards to’ or ‘with regard to’ the right one? In this answer, you use ‘with regards to’ while in this[http://ieltsliz.com/ielts-line-graph-sample-answer/], you use ‘with regard to’ instead. So, which one is correct? Or both are OK? They are both accepted and both completely fine to use. I do not offer free essay marking services. I will soon be stopping all feedback on writing on this blog. The graph below shows the changes in food consumption by Chinese people between 1985 and 2010. The line graph illustrates the variation in food selection (meat,salt,fish) and consumption by the Chinese over the 15 years between 1985 and 2010.Unit is given in grams. overall, among the three types of food, fish was always favourite to the people of china whereas meat saw an upward trend and salt experienced a downward trend over the given period. In 1985,each Chinese person ate 600 grams of fish and after 5 years the proportion reached to 700 grams but there was a slight decrease in 1995.It is noticeable that over the following years it soared steadily to reach the peak at 850 in 2010. At the beginning of the period each person consumed 600 grams salt, but after that it declined gradually and stopped at a low of 200 while meat started with 100 and increased afterwards and got it’s peak at 200 in 2010 as well. Sorry, without the graph I can’t comment. Mam,i tried but i think this site don’t allow graph. Send me a link or choose a graph from my site.